With a clear transparent seat, the Shimmer Bar Stool Clear is a fresh and airy item of furniture that enhances the natural space of whatever location it is placed in, giving a feel of roominess. A brilliant minimalist masterpiece, the Shimmer is not to be missed. The Shimmer has a seat moulded from hard wearing clear acrylic, shaped with a cascading front lip and a low backrest that rises upwards in a flowing, seamless curve. This is both comfortable and space saving in design. The clear seat perches on top of a tubular steel column plated in chrome. The chrome mirrors the surrounding environment and helps the shimmer to almost disappear. This again helps to keep a room feeling large, no matter what the size. A gas lift mechanism gives the ability to raise and lower the seat, as well as 360 degree rotation, making it ideal around the home, at a breakfast bar or kitchen dining table. Your floor will remain unscathed as the Shimmer has a base with a protective rubber floor guard beneath. "Fab looking stool, fits in with all colours"
Really easy to put together look fab and work fab. Great kitchen stool. Exactly as described on website. 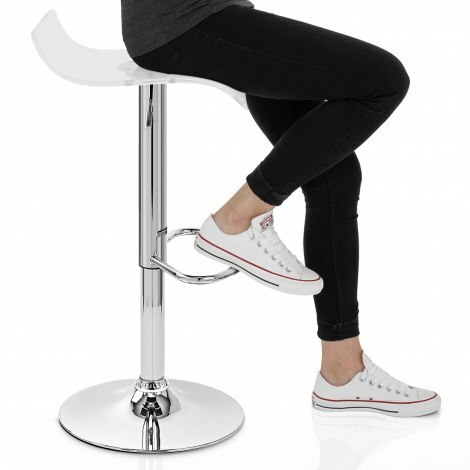 The clear seat allows the stool to blend in with surroundings without being obtrusive. Very happy with the quality of the product very satisfactory, punctual delivery easy assembly. Love these stools.. easy to assemble, sturdy, comfortable to sit on and they look amazing in my new kitchen! I ordered them and they came the next day with free delivery!!! Fantastic! These are beautiful stools and at a very reasonable price. Delivery was super fast and they are very easy to assemble I did two of them myself within 30 mins. They look very expensive. I love them!